Rowland Langmaid (1897-1956). Watercolour signed Rowland Langmaid and annotated HMS Nelson & Rodney and numbered (LL): 21..
Langmaid’s watercolours are all too few and they are invariably beautifully executed. 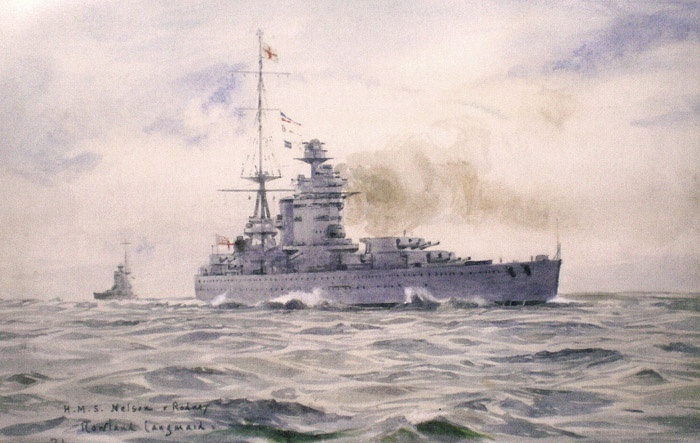 Here he has painted both 16 inch battleships, NELSON and RODNEY almost certainly as they make their way to the 1935 Coronation Fleet Review (on the back of the watercolour has been annotated ” ’35 enroute”). HMS NELSON (Captain A U Willis DSO RN) is wearing the flag of the Commander-in-Chief Home Fleet, Admiral The Earl of Cork & Orrery KCB and leads Captain W N Custance in HMS RODNEY. Both ships are looking their best, NELSON especially because as Home Fleet flagship she expects, and is expected, to set the standards. She will be as closely watched and criticised in her every move and in her appearance as Home Fleet ships themselves will expect to be whilst under the ever watchful eye of their Commander-in-Chief as they all lie in close proximity at their Review anchorages at Spithead. Impeccable appearance, gleaming paint and brasswork, faultless boat drill, prompt and correct flag and signalling standards, victorious sports teams, spotless turnout of her men ashore - all these were the yardsticks by which the officers and men of the Fleet in 1935 judged their seniors and peers at great fleet gatherings such as this where ships representing all Home and overseas Stations and Commands were together for a few short but hectic days. Ships of the Mediterranean Fleet (Admiral Sir William Fisher GCB CVO flying his flag in HMS QUEEN ELIZABETH (Captain S St Leger Moore RN) had, despite the demands of the Spanish civil war on ships of the Med Fleet, come back to UK for a brief spell for the Review, and no Home Fleet man wanted unfavourable comparisons made with 'that lot from the Med’. Reputations would be won and lost.....!